Time for Action, not just awareness! I’m so glad that Dementia Awareness Week has changed its name this year to Dementia Action Week! While awareness is an essential foundation for change, in my view it’s high time we had more action. At Innovations in Dementia, we prioritise action-based projects which will have a real practical benefit for people who are living with dementia. The Getting Along programme, designed by Damian Murphy, is a great example of taking a recognised ‘issue’ and turning it into action. This ground-breaking approach helps couples and families to avoid the many traps that dementia sets within relationships. The formal programmes for couples and families, as well as the training and facilitation courses for staff, equip learners to improve and balance issues in the relationship. Practical actions which can have a massive impact – and may indeed save a marriage. Our Accessibility work strand is also highly practical. We have co-produced checklists to enable groups of people living with dementia to audit both outdoor and indoor public spaces. The DEEP network has produced a guide to accessible information. And my colleague Steve Milton also leads a service called ‘Crystal Clear’, which can help you to create information that is ‘not just easier for people with dementia to use – but easier and more enjoyable for everyone to use and understand’. In contrast, ‘Rights’ may sound very abstract and high level… but again we have tried to bring them down to grassroots so that they are made real – and embodied in action. Our booklet ‘Our Dementia, Our Rights’ is the first written by, with and for people with dementia themselves – and it offers very practical information as to how to use rights in real life. Our Shadow Report to the UN Committee on the Convention on the Rights of Persons with Disabilities contains many real-life examples of rights breaches which call for practical action. (And we didn’t just write it – we supported Keith Oliver to physically take it to Geneva to ensure it really did reach the Committee!). Our recent Yorkshire project ‘Our Right to Get Out and About’ has also supported several DEEP groups to take practical action – including setting up petitions, writing letters, making iPhone films, and designing a huge banner – to highlight very tangible injustices associated with parking and travelling. Too often we hear about the importance of involving people with dementia – only to realise this is at best lip service. To do this properly you have to walk the walk – you have to take action. Dementia Diaries is one example of involvement – it’s an innovative project which uses audio diaries to bring us a wide range of voices of people living with dementia. The brainchild of On Our Radar, Dementia Diaries has now been integrated into DEEP. Rachel Niblock and myself support people with dementia as ‘reporters’. They can use a landline, a mobile, emails or an OwnFone at any time to file their reports – which range from the very personal to the very political! The project has huge potential to educate, to challenge attitudes, to connect and to motivate. 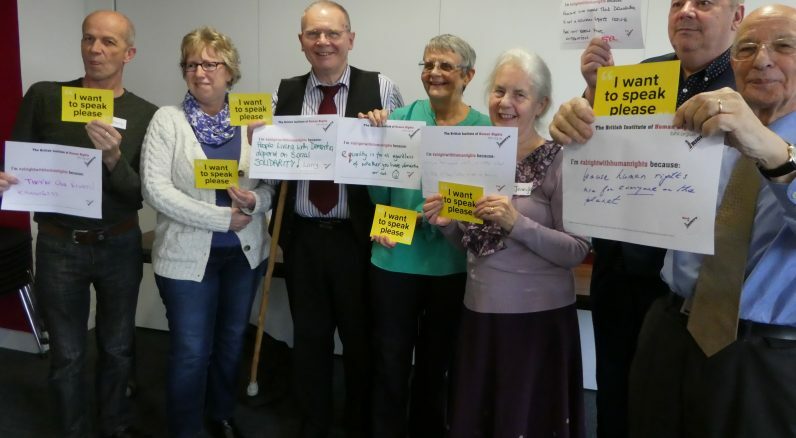 With the Dementia Words Matter Call to Action we again recognised that it was going to take collective action to fundamentally change the choice of words that are used to describe dementia and its day to day experiences. DEEP and the Dementia Action Alliance (DAA) joined forces to produce a film, some guidelines, an infographic and posters – as well as a Twitter campaign #dementiawords. There are many more examples I could give you – but I hope that these few illustrate what we believe about Action. We believe it’s got to be walk not talk. We believe it’s got to be with not for. We believe it’s got to be rights-based not paternalistic. We believe it’s got to start with the person not the service. And we believe we’ve got to get on with it. So let’s crack on, as they say in my part of the world! Leave a commentClick here to cancel reply.